Slightly weaker than the preceding and succeeding seasons as a whole, Season 5 still delivers quality episodes. While The Dominion weighs heavily on everyone’s mind, it is largely absent for much of the fifth season as Bajor and the Klingons become the primary propellant. Sisko’s role as the Emissary becomes better expounded, corresponding with Kai Winn Adami’s increasing antagonism. Odo regains his “powers” while The Maquis encounter a dire conclusion. Leeta’s character evolves, as does her relationship with Rom. DS9 even crosses over into one of the most famous Original Series episodes to save Captain Kirk from an assassination. Arguably one of the best season finales in television history, the season concludes with The Dominion-Cardassian alliance seizing control of Deep Space Nine. Worf reluctantly uses his extensive Klingon knowledge to help Quark seduce Grilka, his ex-wife. Jake experiences first-hand the horrors of war. To prevent an assassination of Captain James T. Kirk, Sisko and crew travel back in time to the Tribble-incident of the original Enterprise. Upon crash-landing, Odo and Quark must work together to survive with limited resources. The Defiant crew encounter their own multi-generational descendants on an alien planet. 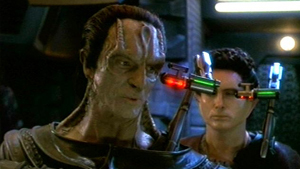 Aboard an abandoned Cardassian station, a salvage team soon discovers that they are in grave danger.